Gasworks Arts Park present From Nature, until 12 November 2017. Over 40 exhibits installed throughout the park. A small gesture in support of love...In the circle of life, I choose to celebrate colour, diversity and love. The winter solstice (21 June) marks the shortest day and longest night of the year, and this was celebrated by the CERES’ Beautiful Darkness event. Project Reclaim embraced the darkness with an exhibition of lace lanterns lit with LEDs, solar powered LED lanterns and cocoons lit up internally with LEDs. Gasworks Arts Park present From Nature, until 30 October 2016. Over 40 exhibits installed throughout the park. 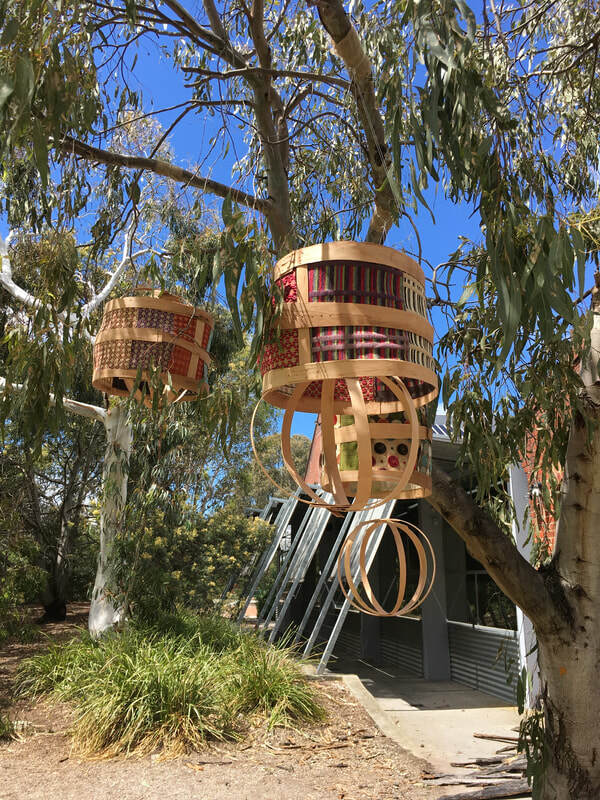 “I almost wish we were butterflies” utilises both organic and non organic materials, with the hero being the designer repurposed fabrics and solar powered LEDs to create lanterns and cocoons. 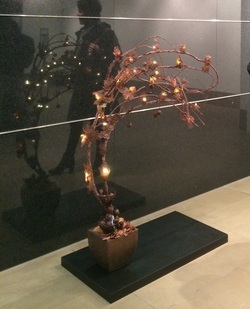 From Nature, an outdoor exhibition highlighting organic pieces emerging from nature. 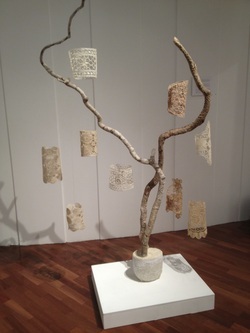 Both pieces "Fill the Void" and "Nest" combined remnant fabric with natural fallen tree branches and empty seedpods. The pieces provide a more subtle environmental message about reuse and nurture. On for one weekend only 11-12 April at Gasworks, Port Melbourne. 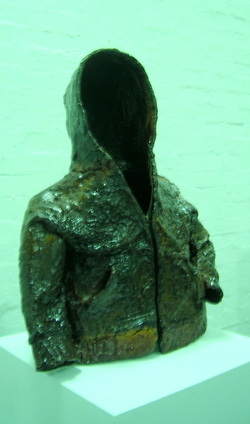 A piece from the Hoodie series, called Slumber, on exhibit at Toyota Spirit Community Gallery, Nov 2014- March 2015. 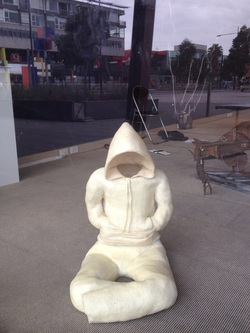 Project Reclaim and Ponder the Hoodie, joint exhibition at St Kilda Town Hall Gallery. Project Reclaim has its own store at Upper West Side for the month of July. Come to corner of Spencer and Little Bourke Streets Melbourne. Part of 8 exhibiting artist shows. 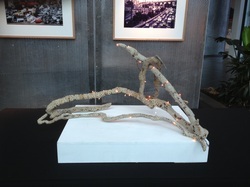 'Secret Garden' on exhibit at World Trade Centre, 25 Artists exhibition, curated by Mars Gallery. Inspiring concern & healing for planet earth & all life raising awareness within the wider community. D11@Docklands is an artist led initiative that supports an interdisciplinary approach to contemporary art practice. 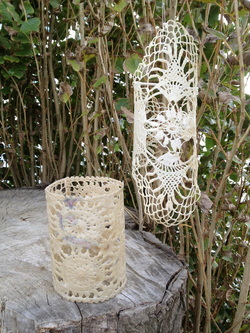 White Lace exhibited at Toyota Community Spirit Galley, opening 24 October 2013 until March 2014. 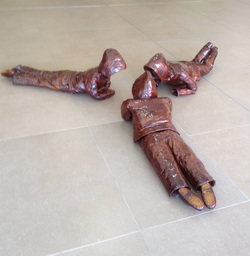 Getting ready for Lorne Sculpture Biennale in March 2014. Site chosen, concept idea accepted and now the really fun parts starts. "The Secret" exhibited at World Trade Centre gallery, as part of the MARS Art Rooms, 25 artists@WTC, group exhibit 5 August- 30 Sept.
'Natural Symmetry' exhibited at Federation Square Atrium Gallery as part of the Liveable and Sustainable Exhibition, group exhibition 29 July- 4 August. 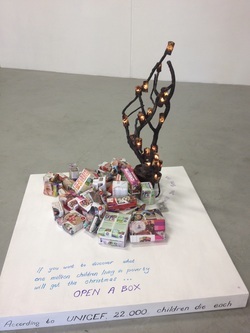 'My Space' exhibited at D11@Docklands, group exhibition. D11@Docklands is located on the east side of the Waterfront City Piazza, just near Harbour Town. 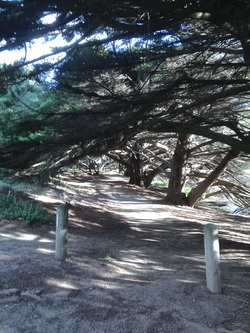 Accessible via the 86 tram. Just get off at stop D11. We are also jut a few doors down from Renew Docklands Community Arts. To be held in March 2014, the artists have been announced and I'm very honoured to be part of this diverse sculpture event. I'm playing with the concept of Reclaim in the Park, using the natural shape of fallen tree branches, with their sensuous curves, contrasted with the human crafted form through reworked antique and remnant crocheted pieces as part of the Sculpturescape works. I've recently experimented with replicating these pieces in Albert Park Lake and looking to extend this at the Lorne Sculpture Biennale. 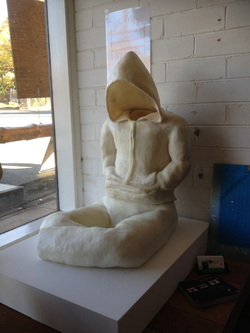 'My Space' sitting in the front window of general store at Jindivick exhibition and wins best use of non traditional materials. In 2011, I donated a piece of art to the Lighthouse Auction. The overall event helped to raise more than $50,000 for the Lighthouse Foundation who aim to end youth homelessness in Australia. The piece ended up winning the Communications Council's Youngblood's award and was auctioned raising $1800 for the cause. The piece was the first in a series to be known as Ponder the Hoody and inspired me to refine the technique much further. Giving really does bring endless rewards! !